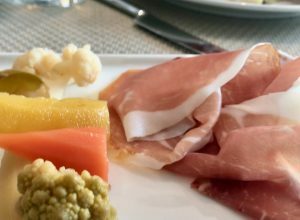 There’s a real trend for sharing platters and wine, with new places like the brilliant Clark & Lake opening, as I reviewed recently. In my mind, however, they really have to focus on the best quality food and drink and of course, offer gluten free options. We all know that sharing is a scary prospect for a coeliac, so I was careful to check in advance before trying out the gorgeous new “wine cafe” at 120 Dundas Street. There can be no doubt that a lot of effort has gone into this place: the design and finish is of the highest quality and the father and son team have sourced some superb food and wine. While it is clear that they are still finding their feet as the new lunch menu evolves, there is an undoubted strong focus on quality. The lunch menu had no GF options, but a meat and cheese sharing platter for three was a good option for our business-focused lunch. With little gluten free oatcakes and biscuits on the side, extra serving cutlery and some separate plates for the gluten eaters, we did well with the sharing. And the food is utter delight! 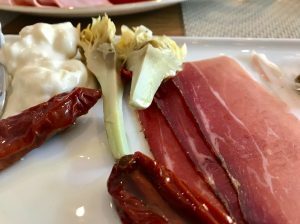 Gorgeous parma ham and some delicious speck came alongside zingy sundried tomatoes, pickled vegetables and artichokes. Add to that, the most amazing runny pile of gorgonzola (my favourite cheese! Mellis does a wonderful one), some crumbly but creamy brie and delightful little cubes of taleggio and other cheeses, and this was a brilliant lunchtime treat. Sadly I had to turn away from the beautiful patisserie, but for the gluten eaters it looks amazing. Working lunches can’t really include wine, but one of our group enjoyed a superb glass of Italian white, and we were given a tiny taster too – just stonking. This will be the ideal place for an after work dinner and snack. As they build their repertoire and confidence in gluten free offerings, it will soon be a favourite destination, particularly given its convenient location to my day job! Give it a go and I’d love to hear how you get on.